Thayne-san, the shop we’ll be visiting today is a kimono shop that was founded in the middle of the Edo Period. It’s called Ginza Echigoya. The Echigoya Building faces Ginza Chuo Boulevard, and the shop is on the first floor. I see. The shop entrance is on the opposite side of the building from Ginza Chuo Boulevard, so it has a nice relaxing appearance. The kimono and obi on display in the display window are really beautiful, aren’t they! Very refined. I suppose they match the tastes of people in Ginza. Hi Thayne-san, Concierge-san. I’m Jinemon Nagai. It’s great to meet you, Nagai-san! Thanks for having us today. By the way, you have a wonderful name. Thanks. Jinemon was the name of the first owner and has been passed down generation to generation since then. I only started using this name after assuming ownership of the shop from my father. Until then I had a completely normal name. About a year after my father passed away, I went to City Hall and submitted the forms to officially adopt the professional name of my father and the previous owners. You don’t have two names like an actor—you really did change your official name?! I’m surprised. So the original owner’s name was Jinemon? That’s right. 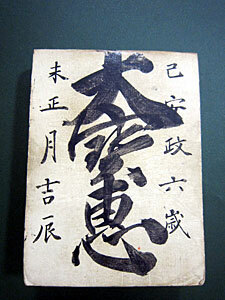 The original owner was from Takada in Echigo, now Niigata Prefecture. 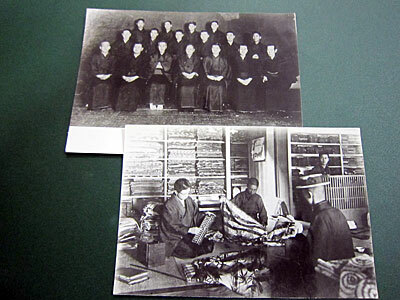 He came to Edo and started an apprenticeship under a soba shop . He did odd jobs and received board, and at night did things like reading, writing, and learning the abacus—basically, he studied. As he grew up, he struck off on his own. He　opened a shop in Kyobashi as a dyer. 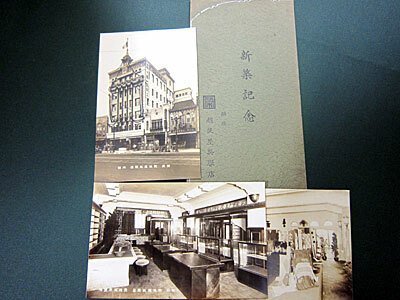 It was apparently the second-generation owner that moved the shop to Ginza. To be able to open a shop in Ginza, the original owner must have worked really hard. That might be true, but at the time Ginza wasn’t a high-class area. The center of commerce was Nihonbashi, and Ginza was full of factories. 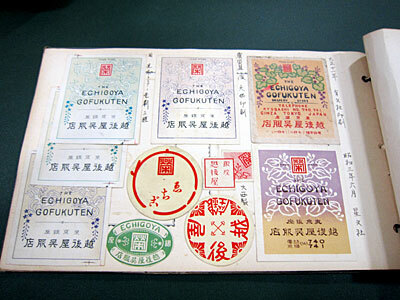 In fact, that’s how Ginza got its name—there were lots of foundries that made silver or gin coins. So I think it was actually relatively inexpensive real estate. Has anything from the shop’s early days survived the years? Most old shops in Tokyo have little left from the old days due to fire, the Great Kanto Earthquake, or the war. Our shop is no exception; most things were lost to fire. 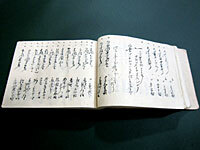 However, some of our old ledgers survived. I can’t quite read what it says. 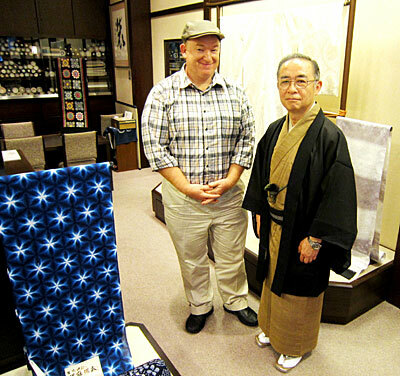 This one is of the inside of the shop, with a customer being shown some kimono fabric. And this photo of the staff was taken in 1916. In the center of the front row is the fourth-generation owner. To his left is the 5th generation, and to the left of him is my grandfather, the 6th. This last picture shows the new building when it was completed in 1932. How impressive! The outside of the building is quite stylish, and the inside looks gorgeous. 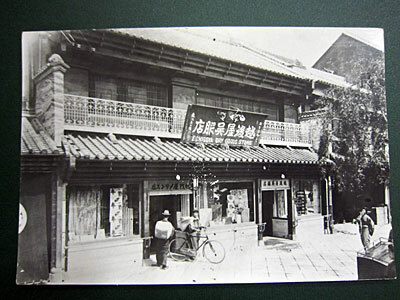 Historical photos, including the new building completed in 1932. Thank you. We also still have some of the old product tags and stickers, which the head clerk at the time organized neatly. It’s amazing how sophisticated-looking these old designs are. They’re beautiful! They really are treasures. By the way, I really like the kimono you’re wearing too. As the owner of a kimono shop, I guess it’s only natural that you wear a nice kimono. No, actually, on most days I wear Western clothes. They’re just easier to move around in. But on special occasions, like today, I dress up in a kimono. That’s right, I thought I would dress properly for you! I hear people say a lot of good things about kimono, but what I like about them is the fact that by putting on a kimono in this modern age you get a special feeling. When I put on a kimono, I’m a different person. I look smart, and it feels good. That makes sense! What do you call the type of kimono you’re wearing today? This is an unlined hitoe kimono made of silk pongee, with a hakata obi. Over that, I’m wearing a sha haori. The slight transparency of the sha haori looks airy and cool. Very sharp. Right, since it’s summer, I want something that looks cool to wear. That’s a key thing about kimono style—how it looks to other people is more important than how it feels to the wearer. That’s quite a sophisticated sense of fashion. There’s really nothing to it. There are some people who feel strict about it, saying, “You can only wear a hitoe kimono after this particular date,” and so on, but I think it’samatter of personal style. It’s just clothing. That makes me feel better. I don’t have many opportunities to wear kimono, but maybe I should give it a go sometime. You should! You have the perfect build for wearing kimono, so there’s no doubt it would look good on you. We’ll start our window-shopping right away! Thanks again for your time today.